Salespeople know a lot about buying decisions – how they are supposed to be made, as well as how they are really made. They know that there is a ‘by the book’ way of buying set out in corporate procurement policies and taught on procurement training programmes. But they also know the reality of how decisions are made by under-pressure managers, including the impact of politics, relationships and other factors. Many salespeople have seen neatly ordered flow chart buying process diagrams with their straight lines and square boxes. Shown below is a typical example – the ‘real-world’ process for the purchase of an IT system within a Fortune 500 global corporation as shown in our 2010 book The Sales Revolution. It is a text book example of how a project, or purchase decision should be made. The Fortune 500 buying process contains flow charts, information checklists, a map of stakeholders, a cross functional buying team, senior management oversight and stage-gate approvals. If an engineer was to design a process to buy then this would be it. The process is a the ‘fail-safe’ process for building a logical argument for the purchase. That is a compelling business case to win senior management backing. How to make the decision is clearly laid out. There is economics (i.e. the analysis of costs and benefits), as well as; considerations of; risk, strategy, compliance and politics.It is the equivalent of painting by numbers – the rationale for buying is built and tested through each successive stage of the buying process. This is how decisions should be made! To the outside observer the business case is the very definition of logical and analytic decision making. It would make any MBA graduate proud! Managers take a bow! In an era of slashed budgets and competing projects it is the perfect way to decide what purchase, or projects should proceed and which ones should not. However, could it be too perfect to be true? Well, when it comes to real world buying it is only half of the picture. If computers or robots made buying decisions then the model above is exactly how buying decisions would be made. The only problem is that people, not computers make most of the decisions. Look in the gaps between the square lines and boxes of the flow diagram and you are likely to find some ‘messy stuff’. The stuff of people, rather than computers. As every salesperson knows companies don’t always buy ‘by the book’. The science of decision making tells us that the 100% rational-logical decision is an illusion. Even professionally trained buyers are subject to making assumptions and jumping to conclusions. Human fallibility means that people are prone to; misread the information, be unduly influenced by others, or be swayed by impulse and emotion. So, there are two sides to the reality of modern buying decisions the rational and the psychological! There are two sides to every buying decision. There is that aspect of the buying decision that is set out in corporate buying processes and in management training. It is the rational approach to buying to which every manager publicly subscribes. However, there is another side to the buying decision – one that is not captured in corporate memos and procedures. Yet is is obvious to every salesperson. It is the day to day reality of decision making by individuals and teams. Both sides are summarized in the diagram below. 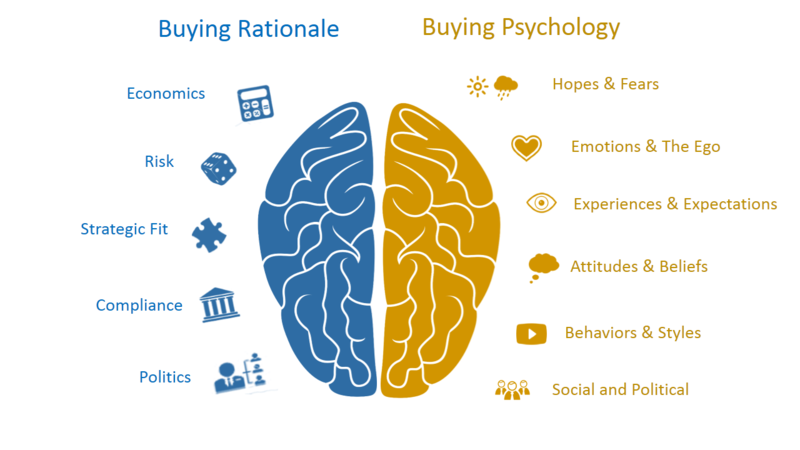 The diagram uses the left-right dichotomy of the human brain to contrast the two sides of the buying decision: Buying Rationale and Buying Psychology. Popular since the 1980’s it is the idea of the brain as two distinct hemispheres – one left (logical, analytical, numbers driven, etc.) and right (creative, emotional, visual, etc.) to paint the full complexity of modern buying. Although science has revealed the human brain to be more complex than the simple left and right dichotomy(1), it is a useful metaphor for the two sides of modern buying. The left side is the rational– analytical approach to making the decision. Just like any other other business decision it is based on an objective assessment of economics, risk and so on. There are steps to be followed and information to be gathered. It is ‘buying by the book’. That is the left hand side of the picture. It is all very logical! People are human, so instinct and impulse inevitably shape their logic. The buying decision is rarely a purely objective one. Attitudes, assumptions and emotions are also involved. The right hand side counter-balances the logic of the left with instinct, impulse and emotion. Attitudes, motivations, behaviors and expectations – these are just some of the factors that result in bounded rationality on the part of the buyer. These factors are more ‘the stuff’ of the psychology major, than the MBA graduate. Just as they are not to be found in the procurement manual, the may not appear in seller’s spreadsheets, ROI calculators and ‘fact finders’ either. When the right side is involved seller needs to think more like a psychologist to understand what is really gong on with the buyer. The left hand side is easier to deal with. It is typically overt, objective and rational and therefore responds well to information from the seller. It is about numbers and fact, information and data, plans and processes. The right side can be more difficult, there is a mix of instinct and impulse, assumptions and impressions. There may also be greater creativity and imagination, as well as a preference for stories and visuals over reports and data tables. If the left hand side involves thinking, then the right hand side adding feelings to the mix. However, that generally does not scare sellers – after all selling hope and fear have long been a part of selling. What your buyer is thinking and how he, or she is feeling about the decision are two different things. As salespeople we need to focus on both. We need to sell to the right and the left. 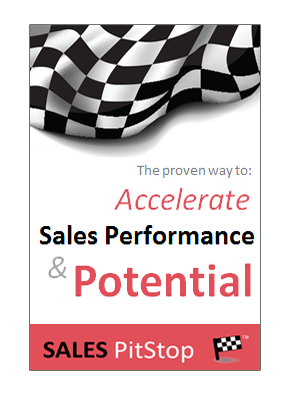 Fact sheets, spreadsheets and ROI calculators are vital sales tools, but they are not enough. 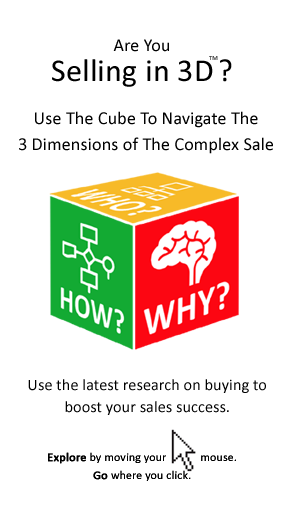 The seller must tap into the buyer’s underlying buying motivations and emotions as well as connecting with the buyer’s logic and analysis. In short the seller must justify with numbers and compel with emotions. (1) The left-right dichotomy of the brain has been popular since the 1980s even though more recent research suggests that it is not entirely accurate. Put simply it suggested that for some people the left hemisphere dominated, while for others it was the right. That naturally made the former (left brained) more logical, analytical, numbers driven and better at language and the latter (right brained) more visual, creative, emotionally more intelligent. Thanks to more recent research we now know that the two hemispheres of the brain are more closely interconnected whether the task is an analytical, or a creative one. Indeed a strength of the brain is the interaction of the two hemispheres. We also know that our abilities to perform different forms of mental activity are not rigid or fixed by a left-right dominance, but can be shaped through practice. Despite the fact science has made the left-right dichotomy somewhat redundant it still serves as a useful metaphor for the two modes of thinking. Thorough post Ray. The graphics are helpful. Anyone who can understand this on the fly, and respond in dialogue based on these fundamental concepts will be very successful in sales.